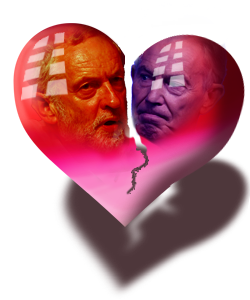 Will Labour Split, Based on What Happened Last Time...? As of the start of February 2019, short answer: unless some people are specifically eager to see the ends of their careers, you'd think it's not so likely. This story has been in the rumour mill for quite some time, and appears in the press every couple of months. So why would I claim they'd be mad to leave? As most will be aware, the Labour Party split previously in 1981, when a number of MP's followed the 'Gang of Four' to leave the Labour Party and form the SDP. At the following election in 1983 the SDP aligned themselves with the Liberal Party, and offered the electorate a coalition. Here's the vote count for the major parties for the elections, prior to, and following the split. As you can see, there was an almost direct shift of 3 million votes from Labour to the Liberal / SDP coalition. The Tory vote dropped slightly. The problem with this, is that under the UK's First Past the Post Electoral System, the shift of votes did not produce a shift in Parliamentary seats. Here's what happened as far as parliamentary seats were concerned. So what we see, is that Labour lost seats, as you'd expect, but the Liberal/SDP pact didn't pick up anywhere near as many as Labour lost, and that actually the greatest victors in the Labour split, were the tory party, who having lost nearly seven hundred thousand votes, actually gained 58 seats. In the following elections, The Labour Party rebuilt itself, gaining votes every election until 1997 when they got into power, but then massively hemorrhaged votes under Blair. That's an entire other story. The Liberal Democrats (as we we know them now) gained seats, while losing votes (The First Past The Post electoral system is odd to say the least), but never managed to gain the amount of seats their support base should have justified. At their absolute best, in 2005, they took 62 seats, which was less than 10% of parliamentary seats, with 22% of the vote. In 2010 They achieved some level of success, and ended up as the minor party in a coalition government with the Tories... who proceeded to utterly annihilate them. In 2015 they got eight seats. Less than the Liberal Party had prior to joining with the SDP. That's what becoming the Tories gimp can do for a party. Why would any new party assume they're going to do any better? In 2010 UKIP recieved just shy of 4 million votes... and got 1 MP. Life is hard for new parties. So Why Would Anyone Want to Do That Again? It should be obvious to anyone who has the slightest grip on history, that splitting the Labour Party is a really bad idea under the current electoral system, because all it does is benefit the Tory Party. Are we to believe that those discussing a split have no idea of history? That they've never heard of the SDP, or what happened after the last Labour split? At the very least, we'd expect them to be pushing for PR prior to a split, if they weren't intent on political suicide, but when was the last time you heard the likes of Peter Mandelson arguing in favour of PR? What I take from this, is that those discussing a split either have no knowledge of history (unlikely), or they would rather see another generation of Tory government, rather than see a Labour government that they aren't in control of. After 83, Labour managed to rebuild, while the Lib Dems struggled to take anything like the amount of seats they should have had under a PR system.... Accepted, they may have forced Labour to move back to the right, becoming Tory in all but name, and maybe that's what those planning a split are hoping to achieve... sacrificing themselves to ensure British politics and the Overton Window swings back to the centre right. It's not impossible that this would happen, but if it does, we know those doing it aren't doing it for the sake of electoral success. It's because they're being funded to break up the Labour Party, to aid the Tories. Labour is a strong brand, and under FPTP it will survive. It might repeatedly lose to the tories, but it will survive At most, those pushing for a split will damage the Labour Party for a couple of terms of govt while the Labour Party rebuilds... and that's what they're threatening to do here. IMO, they are just threatening to force this country into two or three more terms of Tory government, in order to get concessions from the current Labour Leadership, They know full well that under the current electoral system, a split in the Labour Party benefits no one other than the tories. Sources for the figures in the tables can be found by clicking the respective date columns.